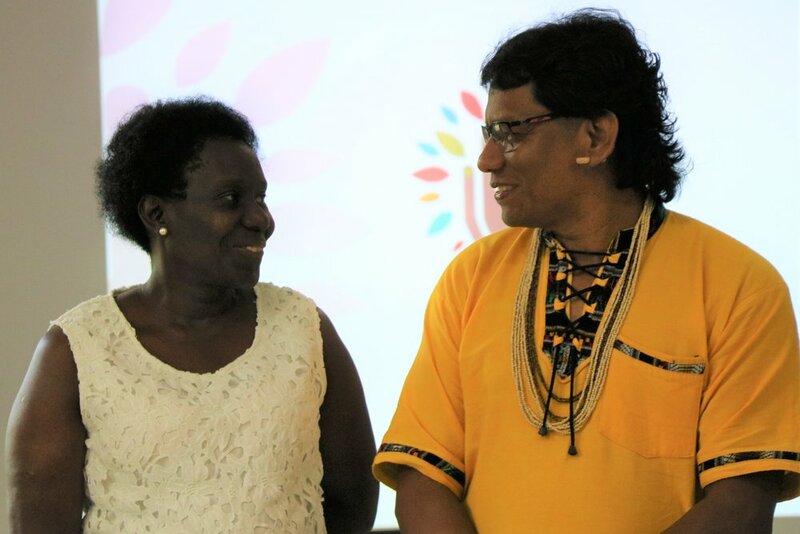 Left to right: Lucely Morais Pio (leader of the Quilombola Community of Cedro and current National Steering Committee Leader) and Srewe Xerente (Indigenous leader of indigenous peoples of the Cerrado region and former National Steering Committee leader). During the meeting a synthesis of the monitoring, evaluation, and referrals related to the subprojects was carried out. This included an analysis of communication processes and presentation of the baseline, which brings a socioeconomic panorama of all the communities linked to the subprojects supported by DGM Brasil. Also worthy of mention is the speech by leader of the Quilombola Community of Cedro and representative of the Pacari Articulation of Medicinal Plants of the Cerrado, Ms. Lucely Morais Pio, who assumes the coordination of the CGN, a position formerly occupied by the indigenous leader Srewe Xerente. During her speech, Lucely emphasized the importance of the DGM Brasil project, together with the Centro de Agricultura Alternativa do Norte de Minas (CAA/NM), for the strengthening of the Brazilian Cerrado communities. The meeting was also attended by the philosopher, human rights activist and founder of the Instituto Socioambiental (ISA), Márcio Santilli, who brought an analysis of the socio-environmental conjuncture.